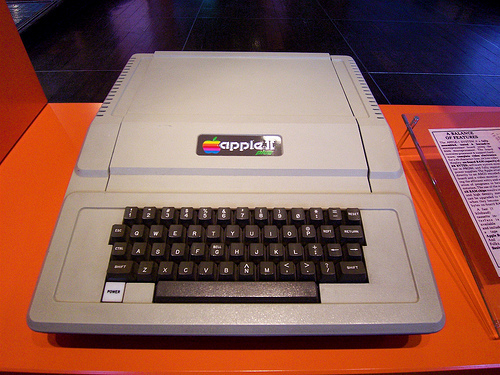 I was a wide-eyed 12 year-old when I saw a personal computer for the first time in my life, an Apple II that belonged to my best friend Hugues’ uncle. Every Saturday night, we knocked on his uncle’s door and asked him if we could play with his computer while he was having dinner with his wife. “We’re going to be very quiet!” we would always tell him and he would let us come in and enjoy this new piece of technology. Ah, the hours we spent playing Odyssey! One or two years later, my friend received the computer as a gift and we kept plugging away, playing games but also learning to code. We were uber-Apple fans! And the arrival of new products like the Lisa in 1983 and the Mac in 1984 sent us in a frenzy. They were too expensive for teenagers but we could dream! Steve Jobs’ passing yesterday brought me back to this seminal era. Being exposed to great technology at an early age made all the difference. It made me who I am and it propelled me into a technology career. Many people thinks Steve Jobs’ legacy was created in his second run at Apple, with the creation of the iMac, the iPod, iTunes and the iPhone but I really believe his first run from the ’70s to 1985 had the biggest impact on me. Thank you Steve for imagining the future, my future.